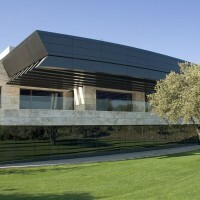 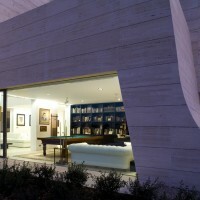 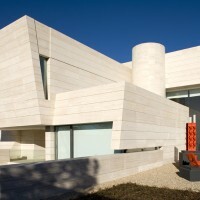 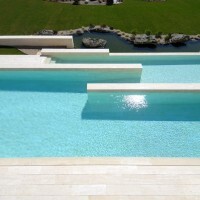 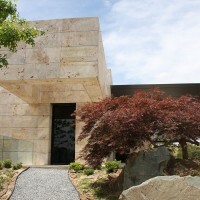 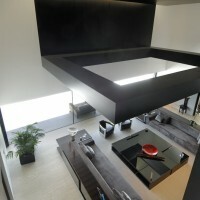 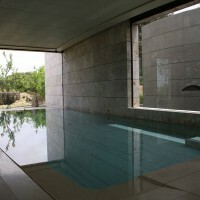 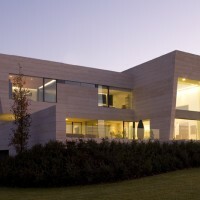 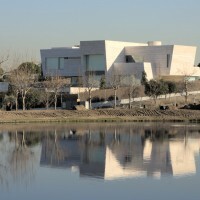 The Spanish architectural firm A-cero designed this home in Somosaguas, a suburb of Madrid. 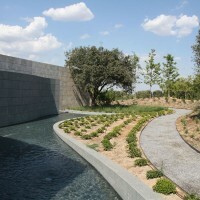 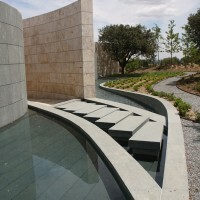 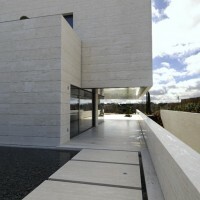 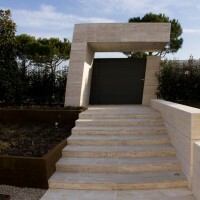 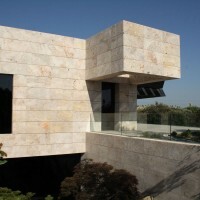 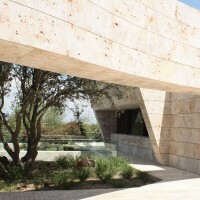 The house is located on a 3.500 m2 plot presenting a light slope that is used by the access ramp to the garage. 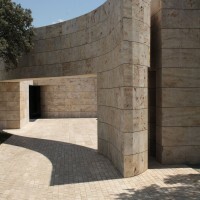 The floor plan has the form of a greek cross, and is delimited by the access pathway and the other properties on both of its sides. 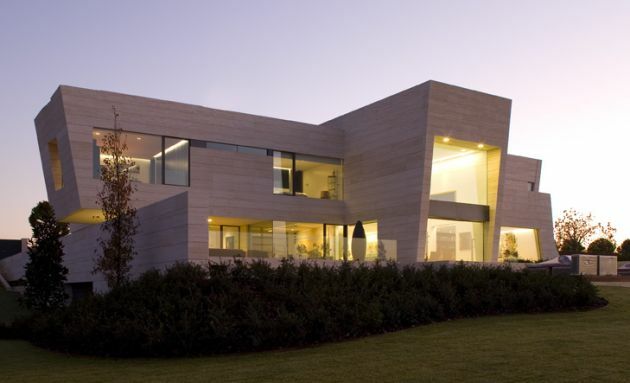 The design of this 1.200 m2 compact single-family house is guided by two main concepts: a great functionality in the distribution of the interior spaces and their openness to the exterior to make the most of the views. 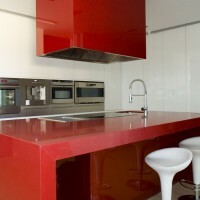 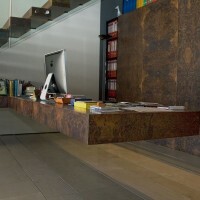 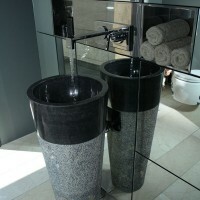 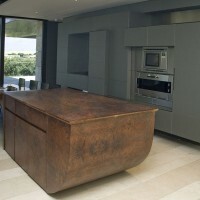 Both ideas are also present in the interior design and in the selection of the construction materials. 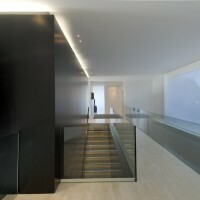 Inside the house, the design follows a functional structure evolving around the hall stairs, an central design element that provokes a surprising visual and spatial effect. 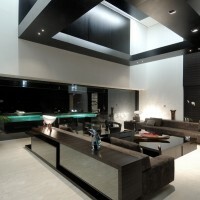 Another breathtaking space is the double height volume that contains the living room. 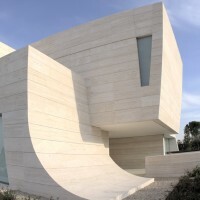 The form has been object of design since the conception of the project, in the same way and degree than any other functional or technical aspect. 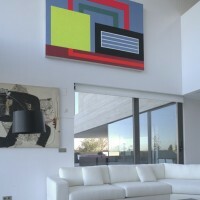 A clear and smooth composition of shapes, born from the encounter of expressive and massive blocks composing a sculptural group. 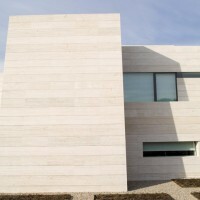 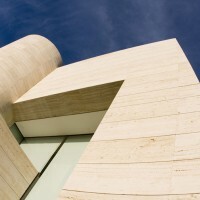 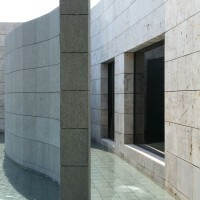 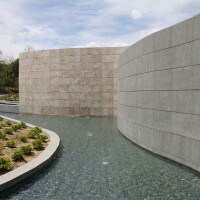 The façade’s geometrical configuration offers inclined walls with clean cuts. 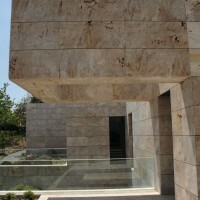 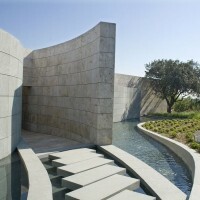 The two rectangular intersected bodies surround the cylinder containing the staircase that connects all the house’s areas. 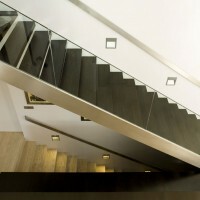 The building is divided in three levels according to the program’s needs. 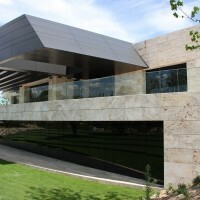 The access is on the ground floor, where all the more public spaces are located: hall, living and dining rooms, office, TV room and kitchen. 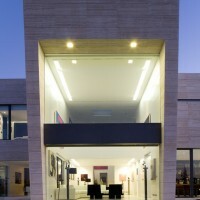 The living room occupies a double height space open to the exterior views through great glass panes. 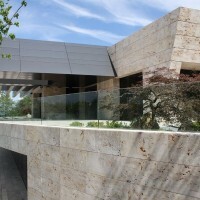 All the objects that could interfere with the contemplation of the views, like railings or walls, have been suppressed or replaced by transparent elements. 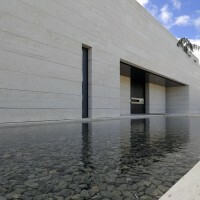 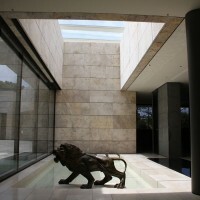 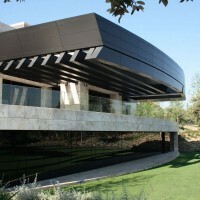 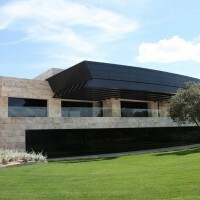 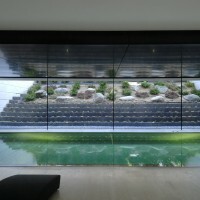 The main entrance door is made of a 6 m high glass pane, letting the visitor perceive the interior of the house. 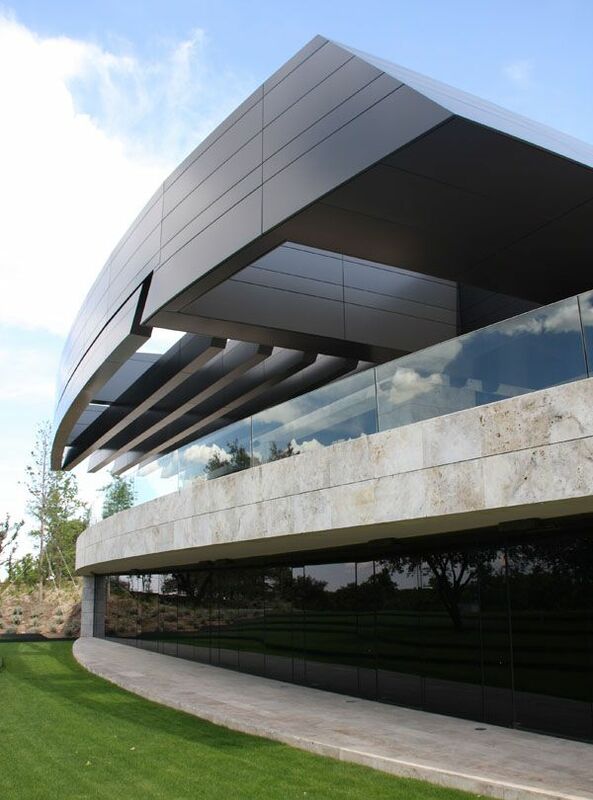 On a lower level are located the technical installation rooms, laundry, indoor swimming pool, games room, wine cellar, garage and a leisure area with a reading space, dining room and TV. 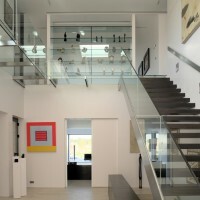 A staircase with glass railings and a glass corridor that goes through the double height space takes to a studio on the upper level overlooking the living room. 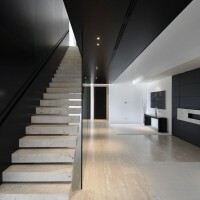 Next to this area are the master bedroom, equipped with a walk-in closet and bathroom, and four more bedrooms with bathrooms, organized around a corridor covered with shelves. 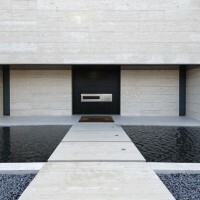 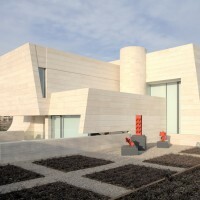 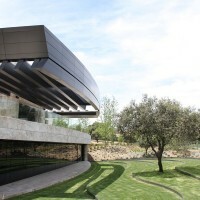 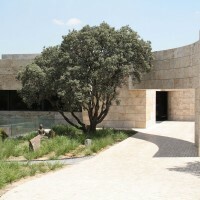 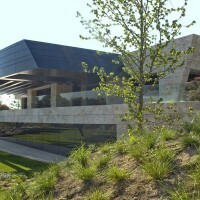 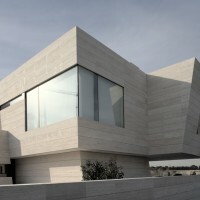 The richness of this spatial composition is also apparent in the exterior, and organizes the connection between the house and its surroundings. 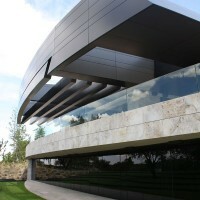 This dynamical and rich design is also translated to a structural system made only of reinforced concrete walls, avoiding intermediate columns that could alter the space’s scale and cleanliness. 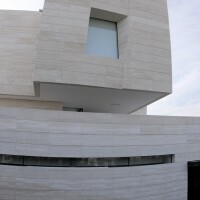 At some point, the structure pierces the façade to form a porch that finishes its composition, protects from the sunlight and creates an interesting play of light and shadow. 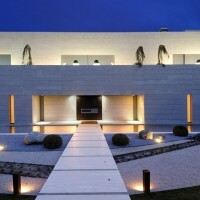 The house is covered with white travertine, creating a clean and smooth finishing, the porch’s floor and the deck surrounding the pool and jacuzzi are made of ipê wood . 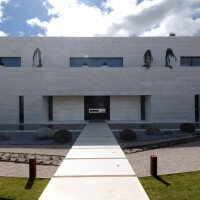 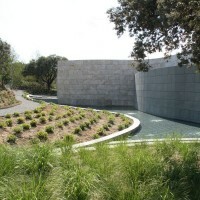 The garden on the front of the house is organized in terraces and parterres, forming a decorative outline surrounded by a surface covered with white gravel. 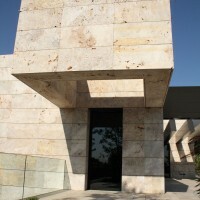 Three sculptures are carefully placed in this place, marking the entrance. 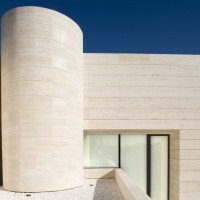 The interior of the house follows the same colour scheme and predominance of natural materials. 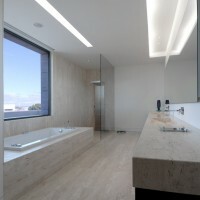 The floors are covered with ceramic tiles and wood on the upper level.